2018 – Sometimes, the little things mean a lot! Gone, but not forgotten! 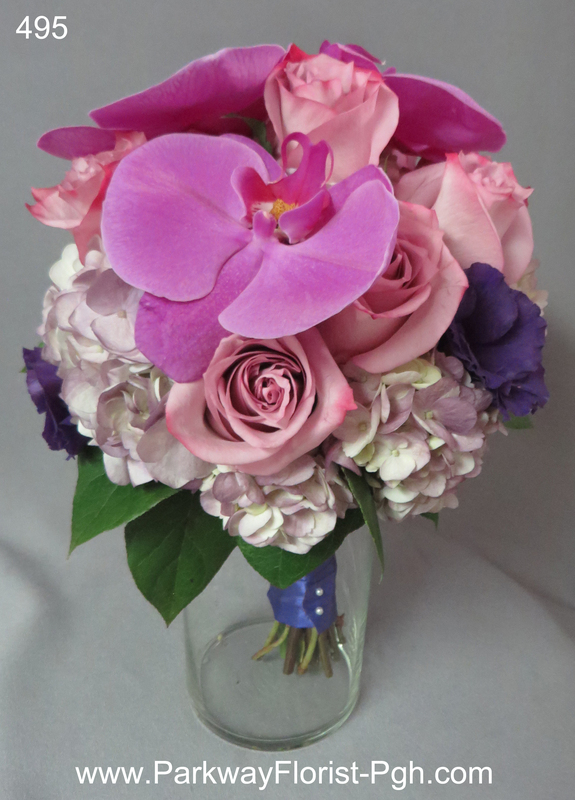 We were honored to be able to help Jennifer with her wedding flowers on Saturday, 7/7. 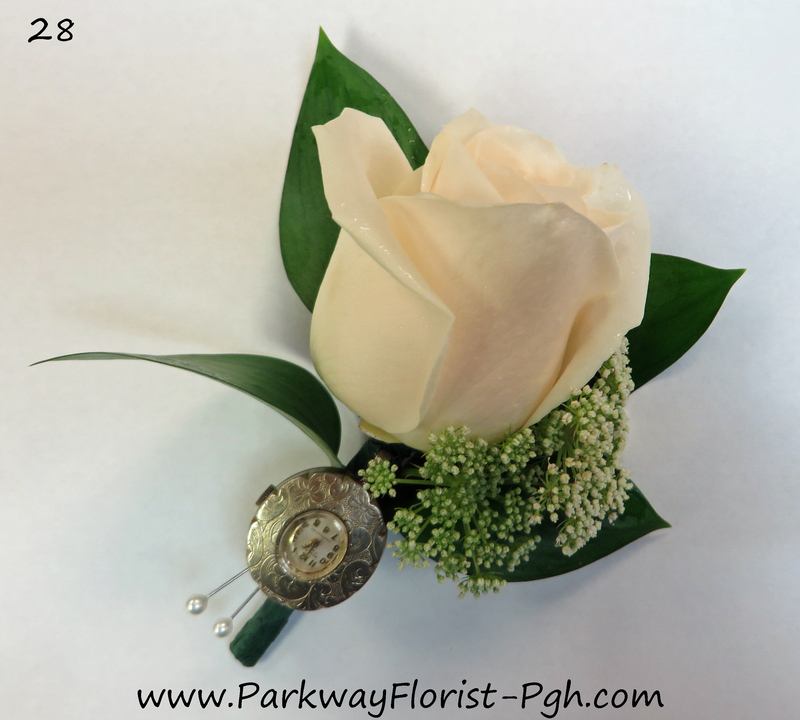 A number of family members were honored in Jennifer’s bouquet through the use of special pins added to her bouquet. Pictured here is her bouquet (841) and her bridesmaids’ bouquet (842). All six family members were surely smiling as she said “I do!” Thanks Jen, for allowing us to be a part of your big day! 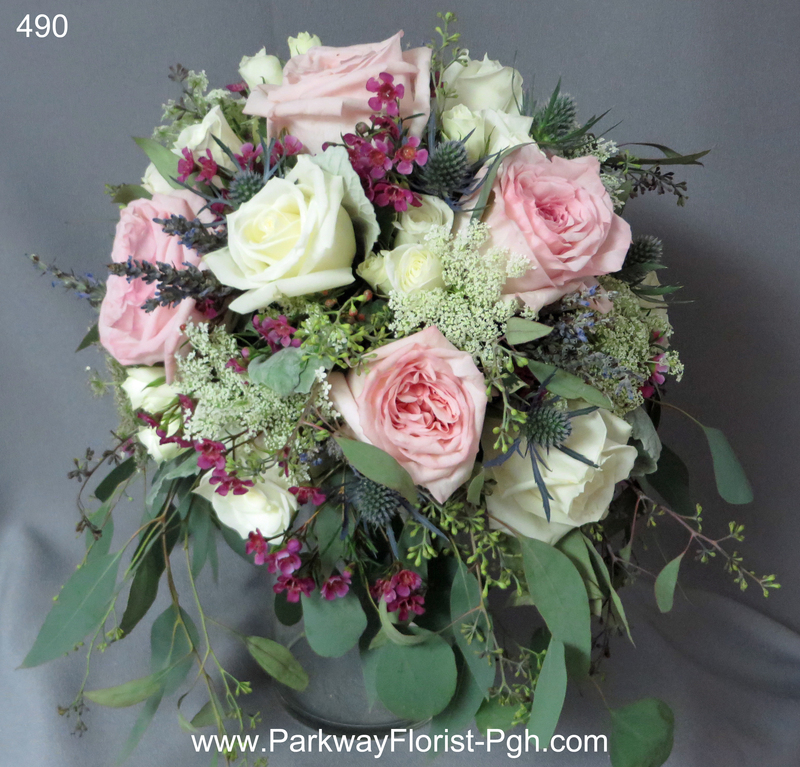 This entry was posted on July 9, 2018, in Exploring Colors, Weddings - 2018 and tagged Blue Wedding Flowers, family, orchids, Pittsburgh Wedding, Roses, wedding bouquet, wedding flowers, wedding flowers pittsburgh, white roses. This summer has brought us many fun and exciting weddings. Most recently, we had two tropical inspired weddings. Both utilized the same concept but took different approaches. This is a great example of why each wedding is so special to us. Even two weddings that pull inspiration from the same idea or item can be executed completely differently. 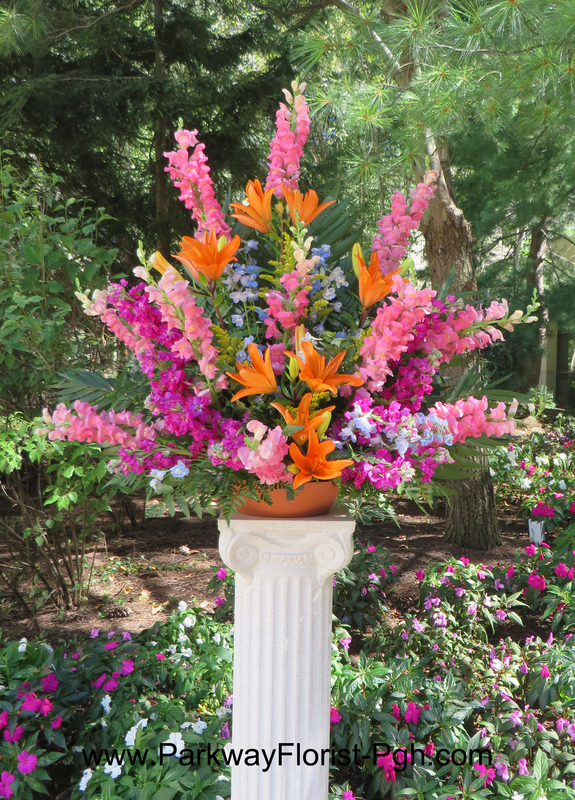 This allows for endless possibilities when it comes to flowers. And with each unique event, we get to provide something original and special. Our first wedding was able to utilize tropical flowers by way of centerpieces. 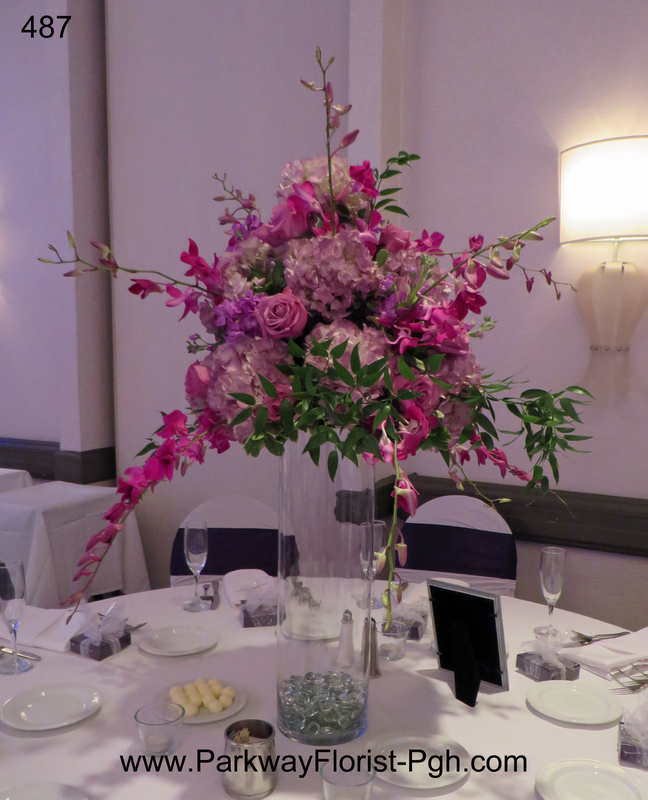 All of the reception centerpieces contained white Dendrobium Orchids. 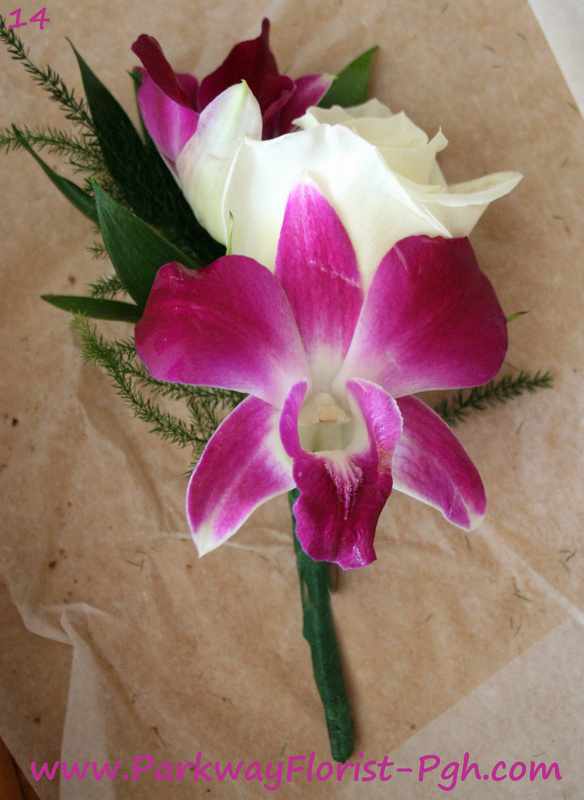 These orchids are quite popular wedding flowers and fall into our tropical category because of where they originate. Dendrobium Orchids are native to Thailand, China, Japan, India, the Philippines, Indonesia, Australia, New Guinea, Vietnam, and many of the islands of the Pacific, including Hawaii. Not being native to America means that they are eye catching, exotic & unique while still being easily recognizable. Dendrobium orchids are one of the most affordable of the varieties of orchids available. With mostly white flowers, this wedding was perfectly timeless and classic with a touch of tropical. 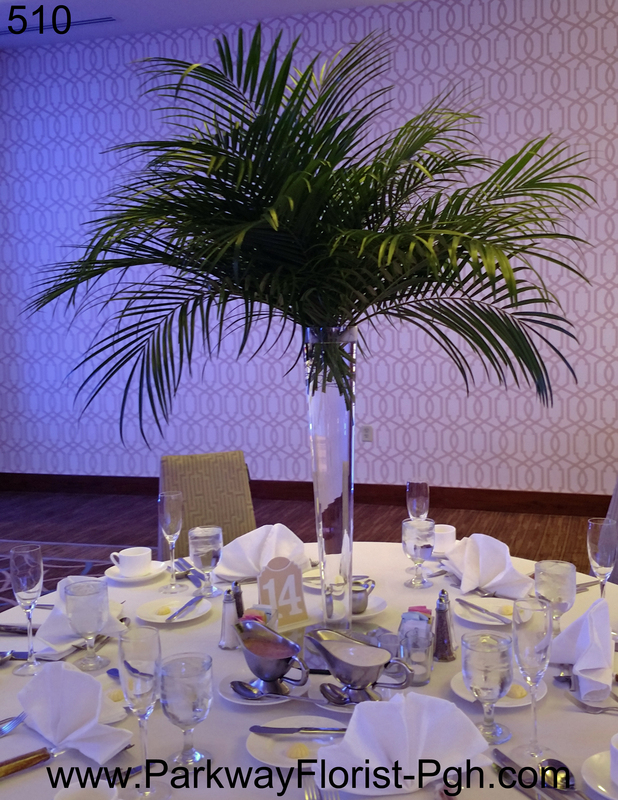 Our second wedding took a more direct approach to tropical by incorporating a beach theme into the centerpieces. For this wedding we paired our designs with some of the bride’s DIY centerpieces for a themed our look. These weddings allowed us to create tropical inspired looks in two totally different ways, challenging our creative minds to design something new for each bride. And that is what inspires us to dream big, and make it happen. Thank you for your checking in with us. We can’t wait to see what the rest of this wedding season holds! 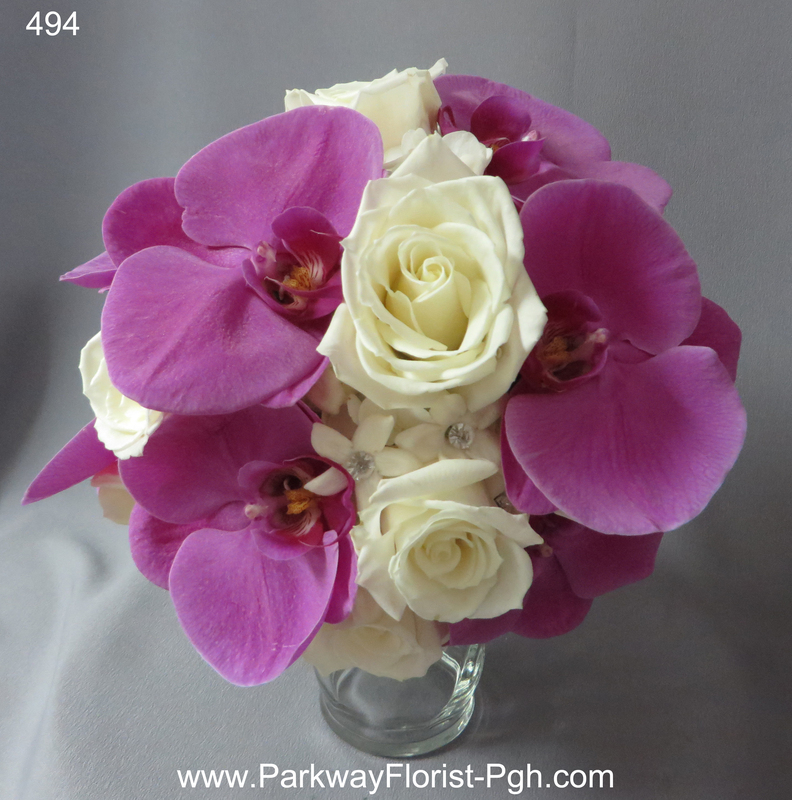 This entry was posted on August 2, 2017, in Weddings - 2017 and tagged Beach Theme Wedding, Beach Wedding Flowers, Dendrobium Orchids, Fun In The Sun, orchids, Pittsburgh Airport Sheraton Hotel Wedding, Pittsburgh Wedding, pittsburgh weddings, summer wedding, Summer Wedding Flowers, Tropical Wedding, Wedding Palm Tree, white wedding flowers. One of our favorite parts of wedding planning is working with the bride to develop her vision. This is what ties together all of the small details to convey an overall theme or feeling for her day. This begins in the planning stages and becomes more developed as the wedding day approaches. A big part of this can be heavily reliant on the look of the reception room. The room is like a blank canvas ready for a painting, and we become collaborative artists. Last Saturday we worked with a bride who wanted a classic, elegant look for her wedding, and we knew just the tricks. Below is The Three Rivers Ballroom at The Pittsburgh Airport Marriott. A major factor that gave the ballroom an elegant and classic look were the gold chivari chairs that were used. Paired with gold overlays on the tables, the room made a stunning first impression. The centerpieces were another important piece of the puzzle. White hydrangeas and roses were the showcased. 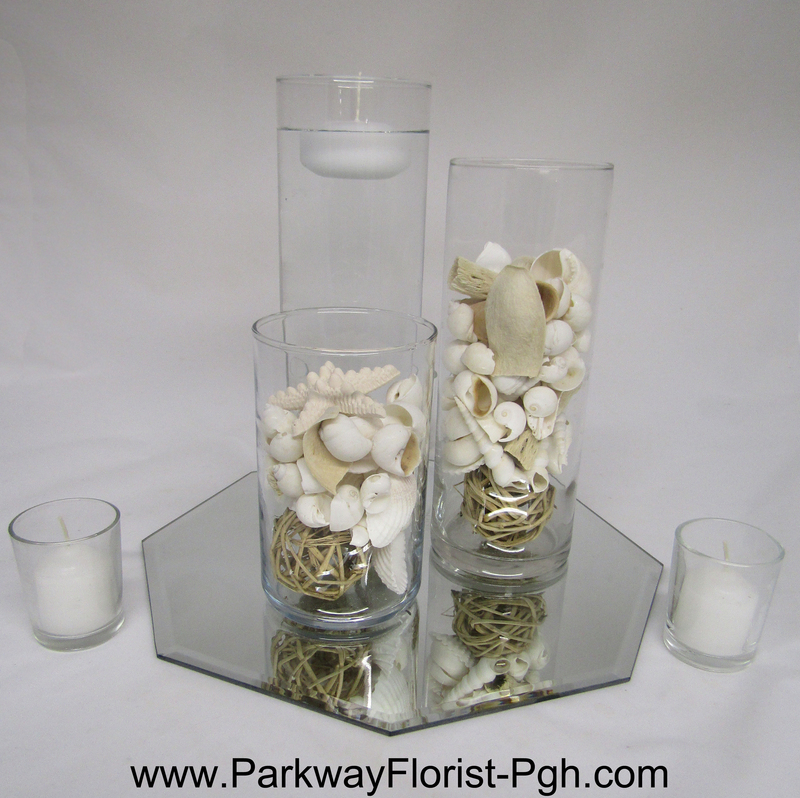 The centerpieces were surrounded by pillar candles on silver candle holders. 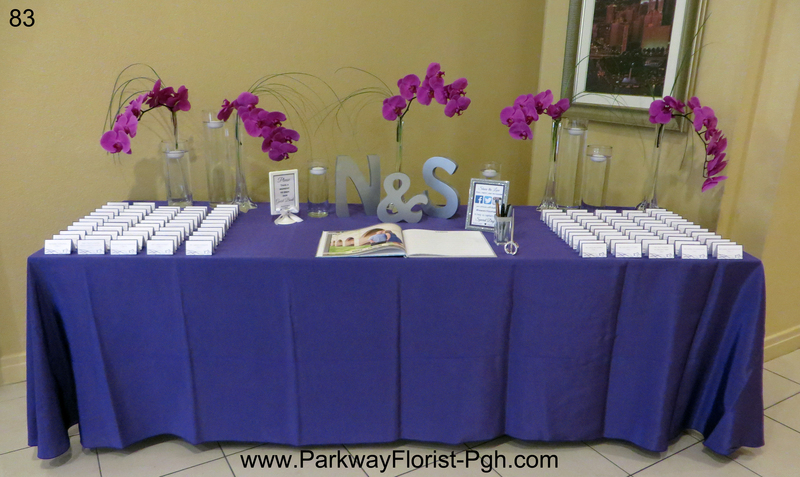 To complete the look, handwritten table numbers were displayed on small glass frames. 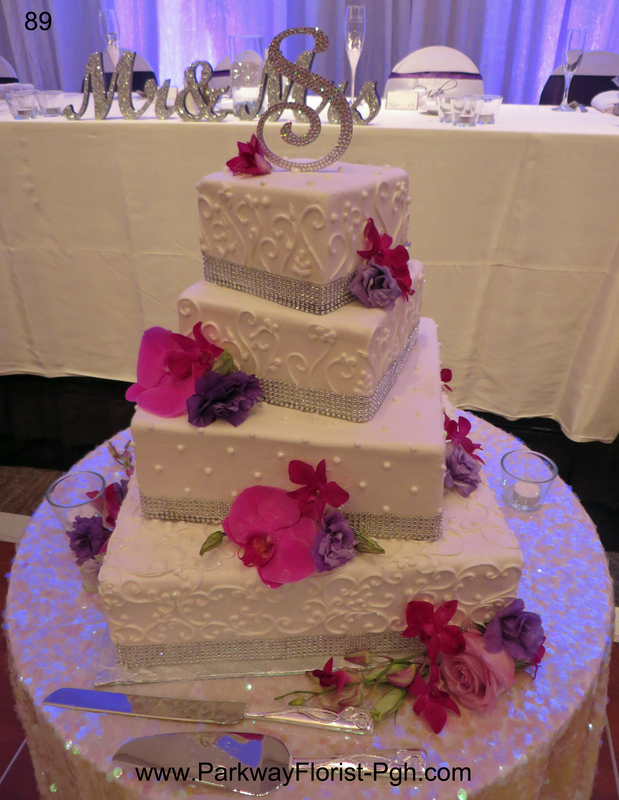 The cake was decorated with white hydrangeas and roses between each tier. 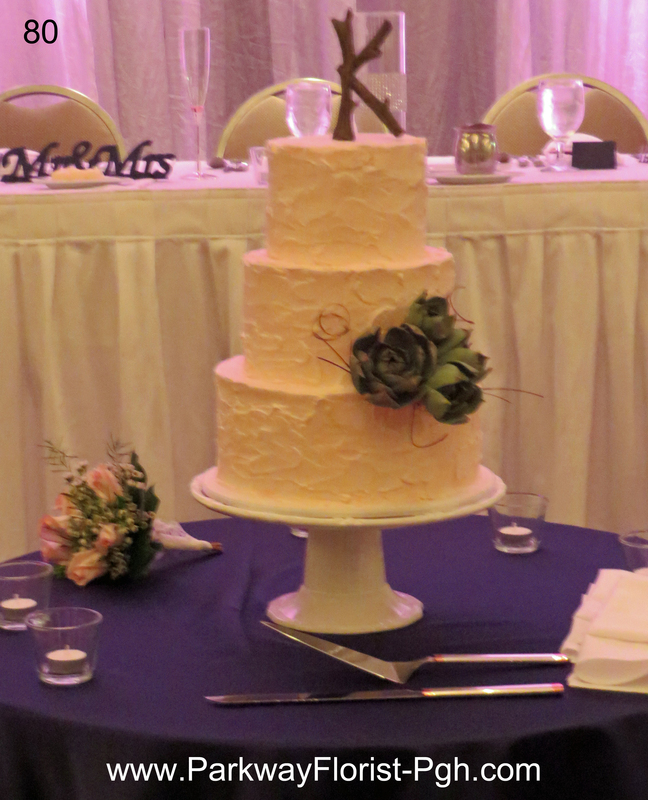 Two flexed roses were used as the cake topper for a natural look. Lastly, our bride carried a cascading bouquet. 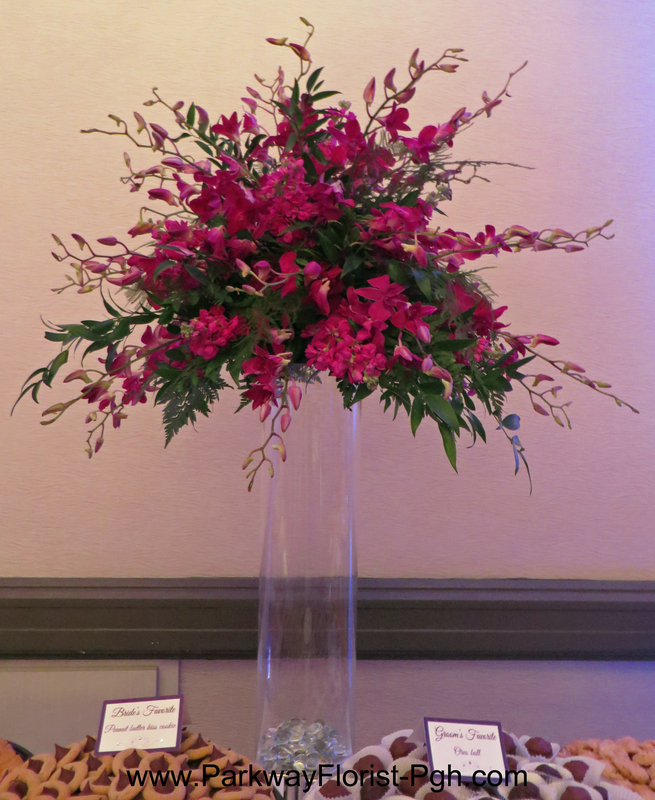 It included blush and ivory roses, dendrobium orchids, white stock, and seeded eucalyptus. 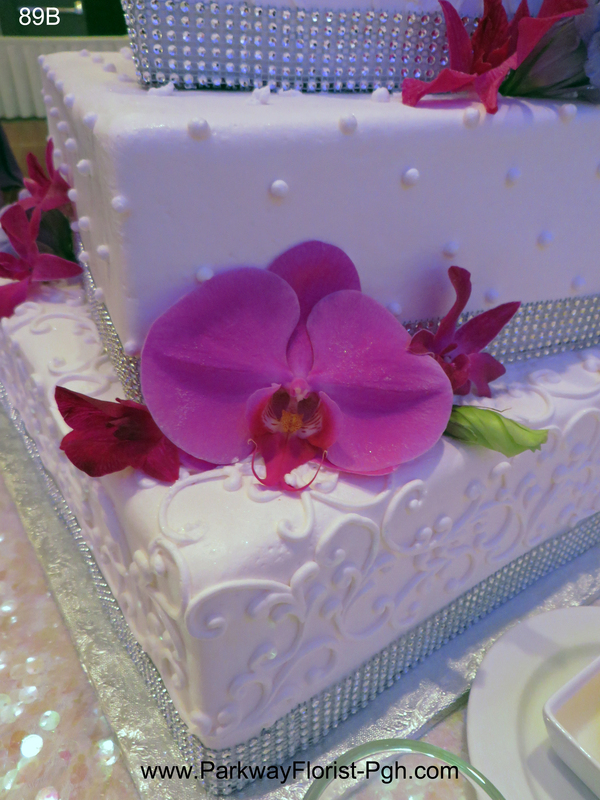 Her bouquet later adorned the bride and groom’s sweetheart table, seen behind the cake table above. The bridesmaids carried simple clutch style bouquets of white hydrangea, seeded eucalyptus, and lemon leaf. Congratulations and best wishes to our beautiful bride and groom! 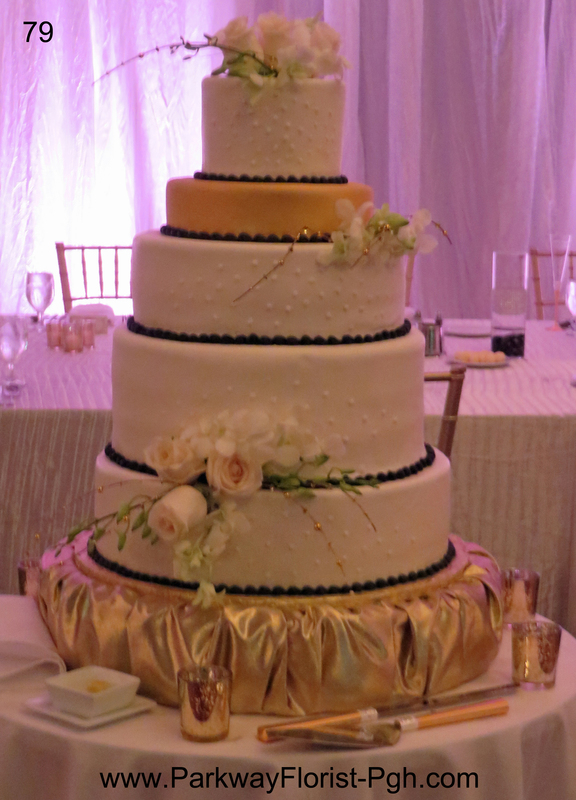 This entry was posted on October 15, 2016, in Weddings - 2016 and tagged almond cake, cascade bouquet, chivari chairs, glamour wedding, hotel wedding, hydrangea, orchids, Pittsburgh Wedding, Roses, silver and gold wedding, wedding candles, wedding flowers pittsburgh. August 1st saw a wide diversity of colors, styles and tests with our brides, bridal parties and their flowers. Our first wedding of the day — a morning wedding — chose the soft pink O’Hara garden roses for her bouquet, as well as her bridesmaids. Lots of texture was included with the use of dusty miller, seeded eucy. blue thistle and purple pride waxflower. 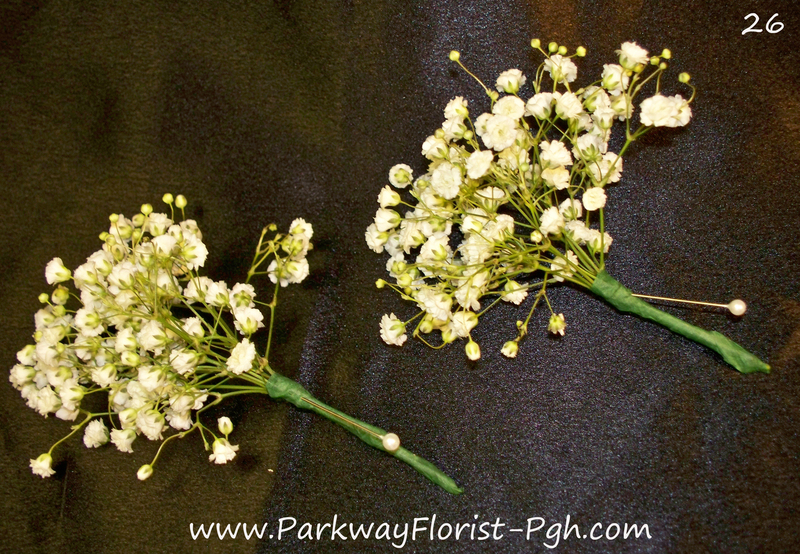 Queen Anne’s lace was an added softness to the bridal bouquet. 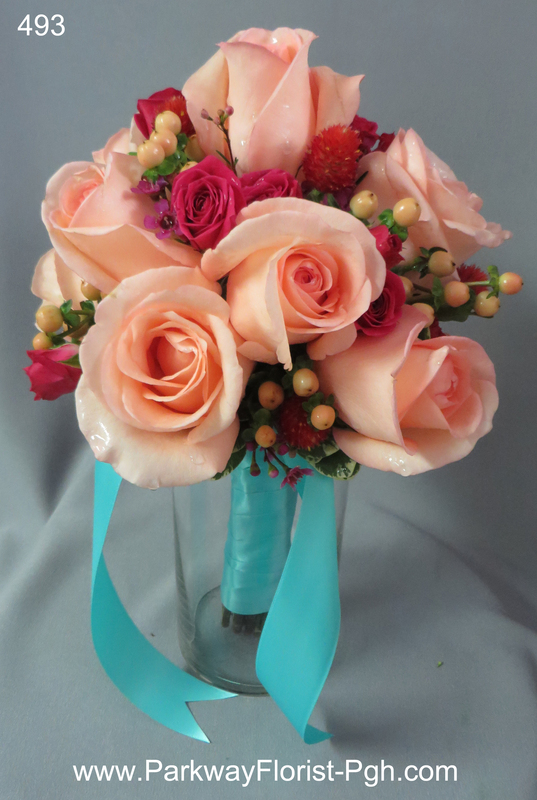 One of our brides chose the classic all red rose bouquet. At her request, we added a little baby’s breath to her bouquet as well as the groom’s boutonniere. Stacey was our “likes bright colors” bride. 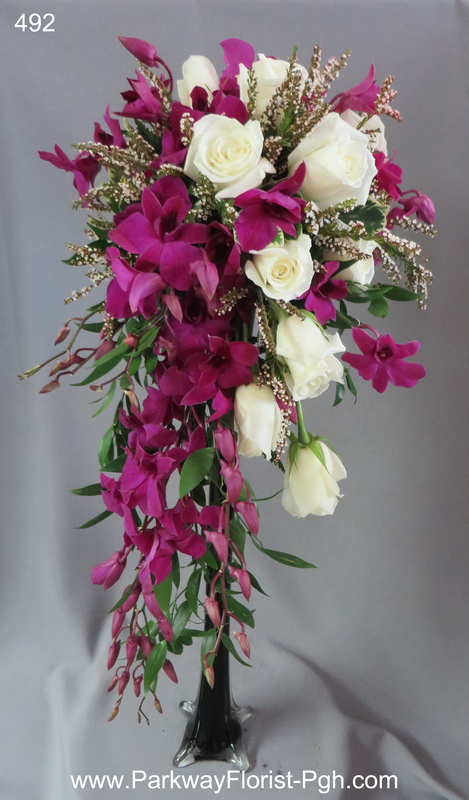 She chose to carry a stunning bouquet of solid fushia dendrobium orchids and ivory roses. her daughter, the maid of honor, held a bright, multi-colored bouquet, which contrasted nicely against the pool blue of her dress. Our last bride, Nicole, was really, really into orchids. 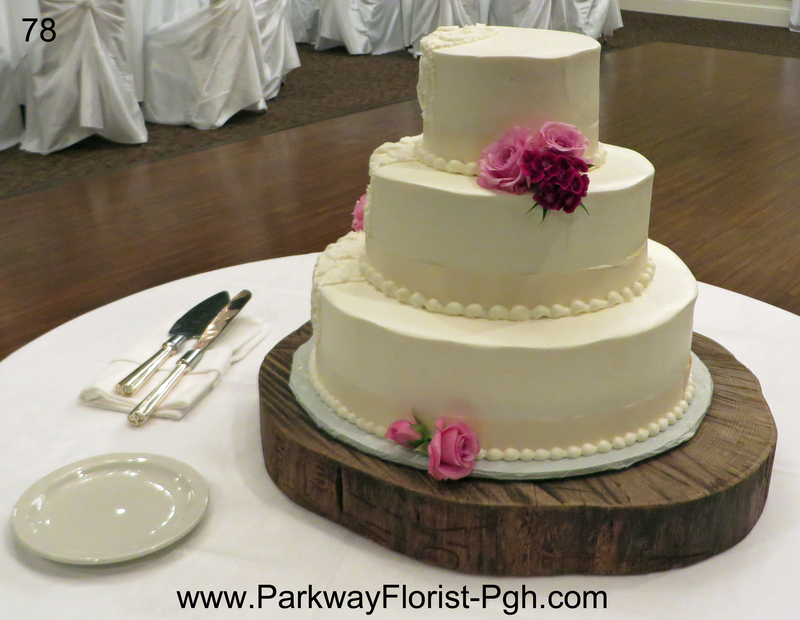 shown here is her bridal bouquet, bridesmaids bouquets, place card table, cake flowers, table centerpiece for the cookie table (a Pittsburgh tradition…..this one contained over 3,000 cookies), the high and low centerpieces we furnished. Lavender uplights helped to complete the look, while a special lighted cube bar kept the party going all night. A fun time was had by all who attended all of these weddings. 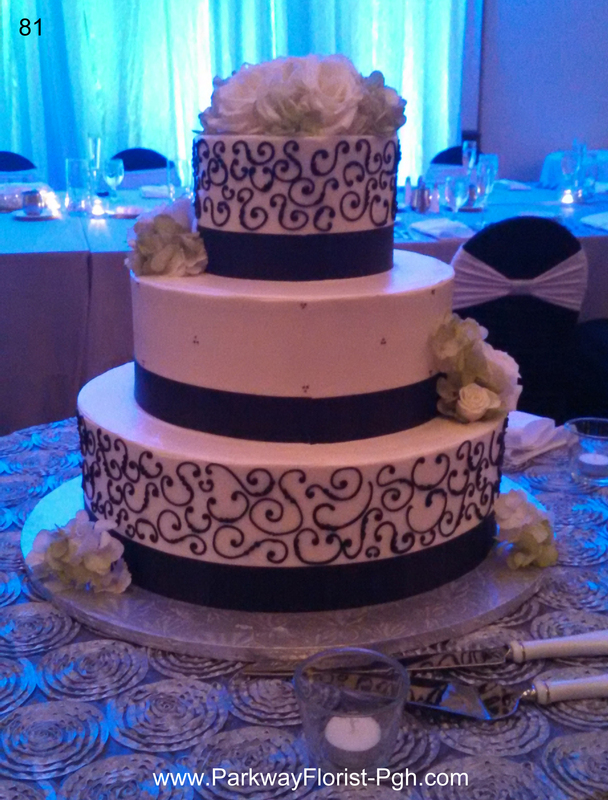 Thank you to Nicole, Stacey and Emily for allowing our staff to help you on your most important, special day! Congratulations again! 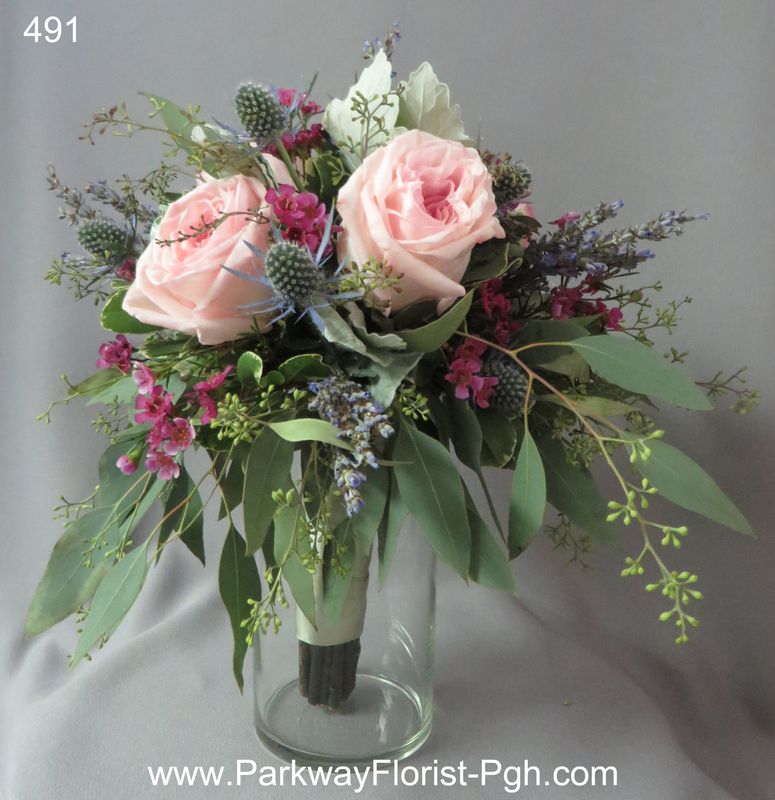 This entry was posted on August 4, 2015, in Ideas & Arrangements, Weddings - 2015 and tagged Emily Baskins, Jessica Mickens, Nicole Orlosky, orchids, pink o'hara garden roses, red rose bouquet, Stacey McMullen, summery colors. 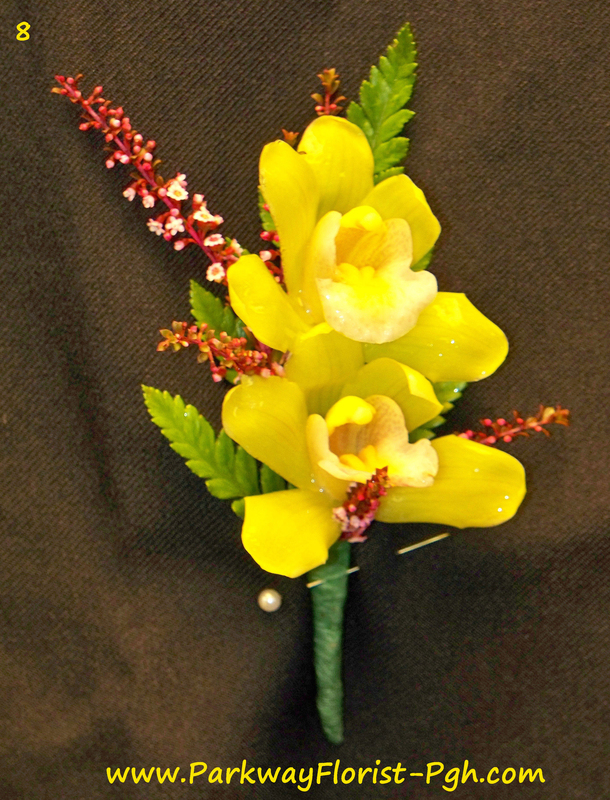 A boutonniere is a floral decoration worn by men, typically a single flower or bud. 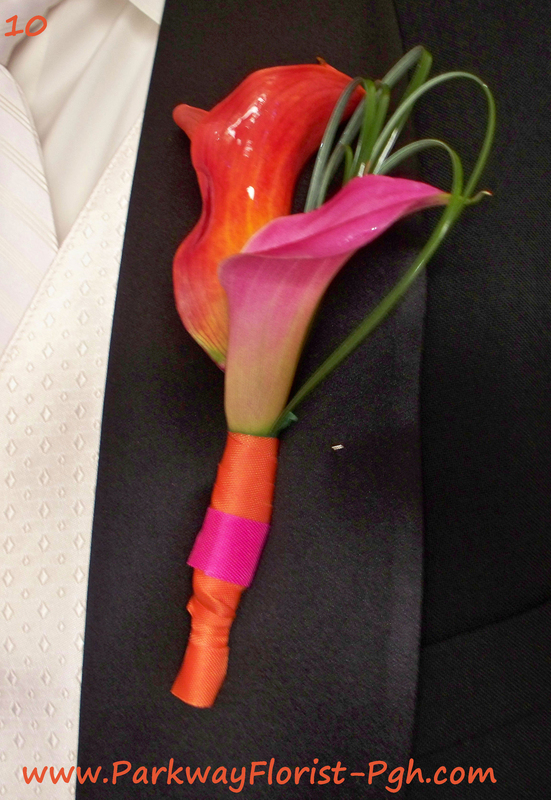 Boutonniere is the French word for buttonhole. 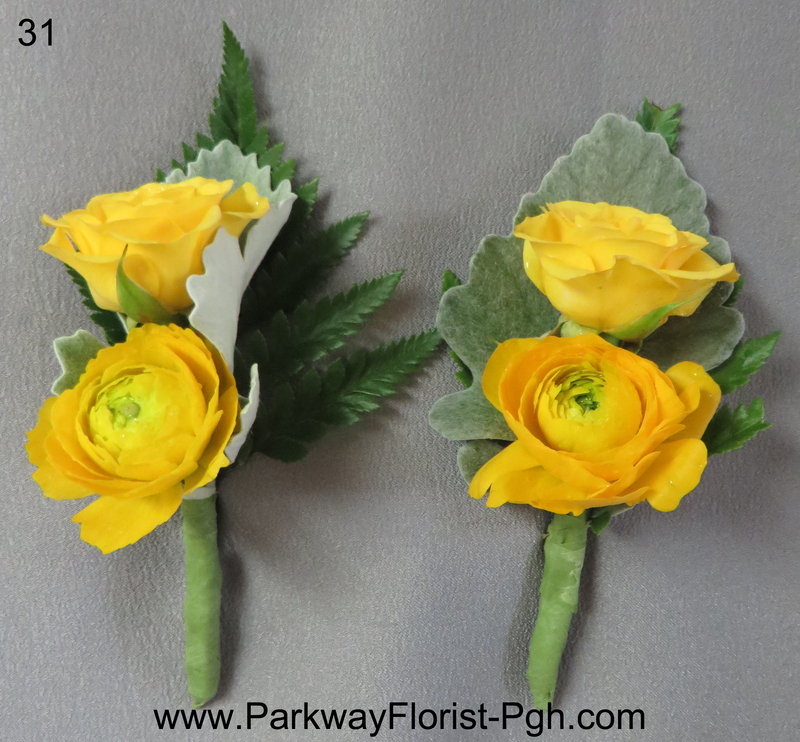 Boutonnieres are usually reserved for special occasions such as proms, funerals, homecomings, and weddings. 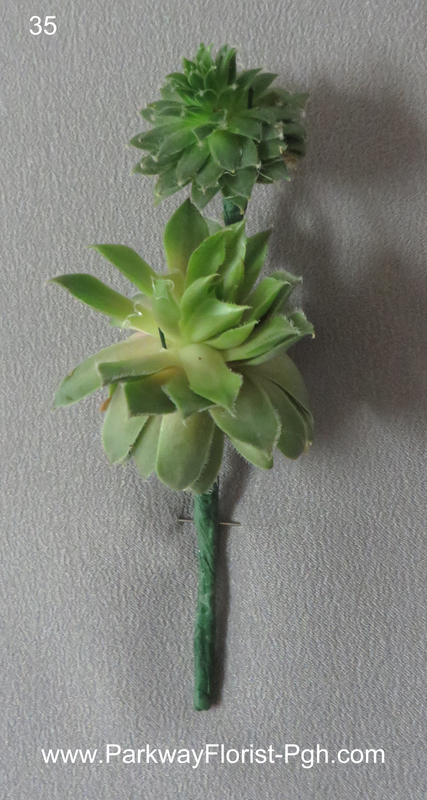 Traditionally, a boutonniere is worn on the left lapel. While in the past the flower itself was often a carnation, today many different varieties of flowers are used. Different colors and flowers may also be chosen to better coordinate with whatever else is being worn. Roses, orchids, berries, grasses, herbs, and so on. 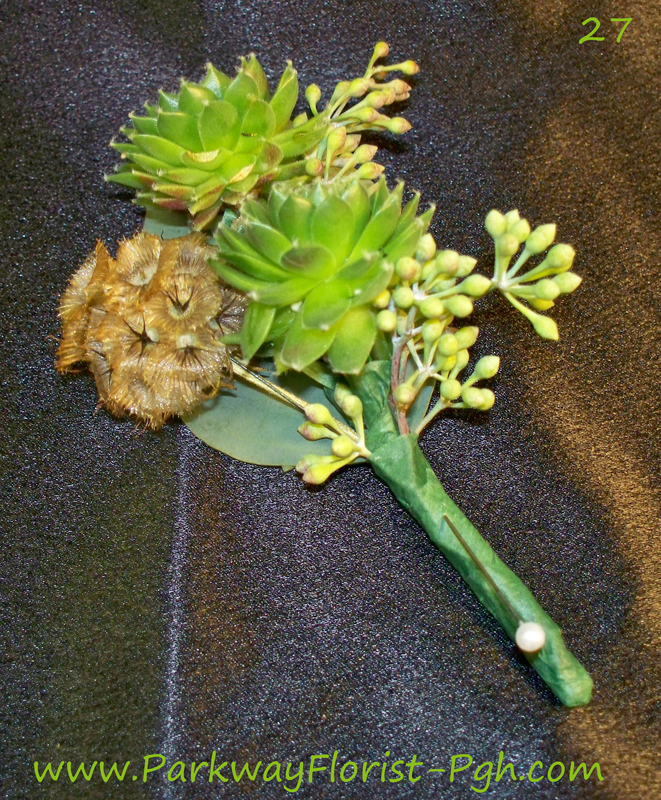 Shown here are some recent examples of boutonnieres we have done. 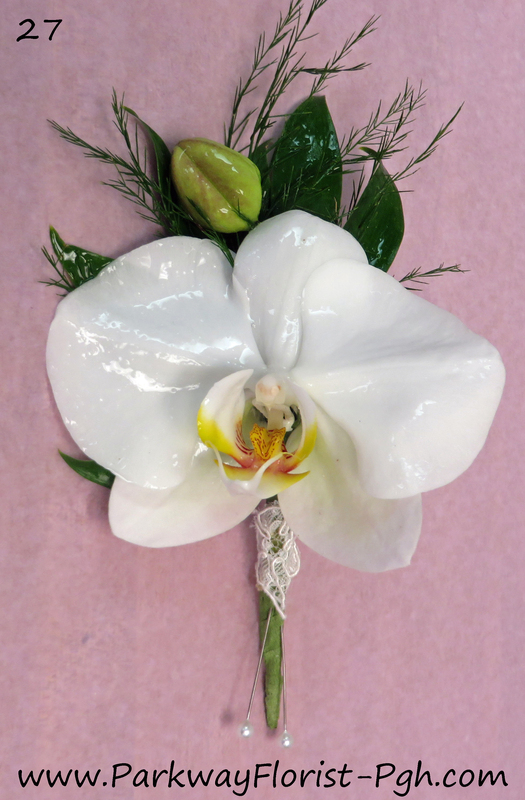 This entry was posted on July 31, 2015, in Tid Bits, Weddings - 2015 and tagged boutonniere, boutonnieres, ceremony, groom, groom flowers, orchids, Roses, wedding, wedding ceremony, wedding flowers. 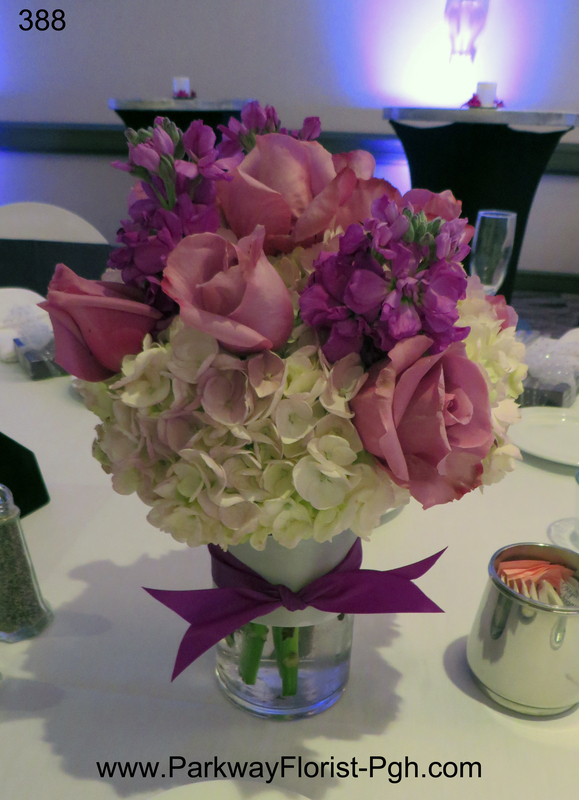 Many weddings today use the Brides’ and bridesmaids’ bouquets to adorn the head table. Sometimes though, we are challenged to truly decorate a head table. 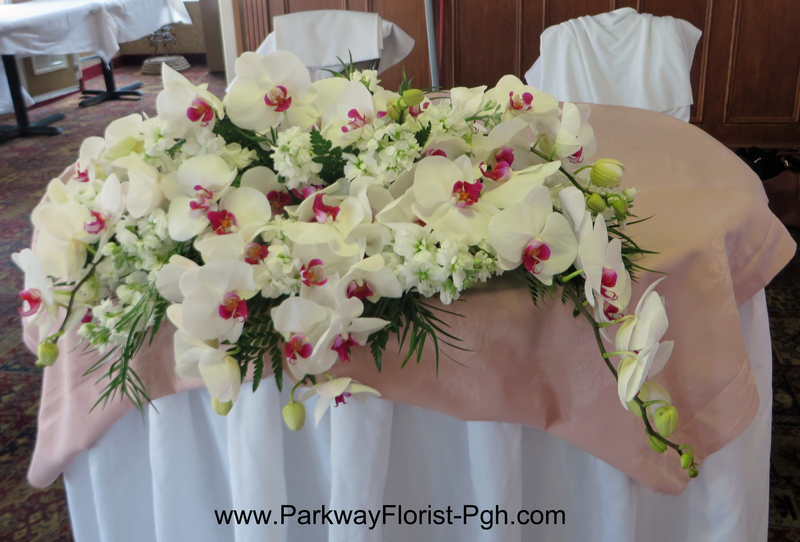 Many stems of white Phalaenopsis Orchids were recently used to decorate a head table. This entry was posted on June 18, 2015, in Weddings - 2015 and tagged cake flowers, cake table, head table, orchids, wedding, wedding flowers.